Opera Garnier - The Paris Opera. The beauty of Paris owes much to the vast public works programme directed by Baron George-Eugène Haussmann between 1853 and 1870, involving major renovation of the city. Many of modern Paris’s busiest streets, avenues and boulevards are a result of that renovation. Medieval neighborhoods that were deemed overcrowded and unhealthy were demolished, new parks and squares were laid out, surrounding suburbs were incorporated into Paris and new sewers, fountains and aqueducts were built. As a result of fierce opposition from vested interests Haussmann was dismissed in 1870 but planned work on his projects continued until 1927. The distinctive appearance and street plan of the centre of Paris today is largely in accordance with Haussmann’s work. Basilica of Sacre-Coeur de Montmartre - said to be the most popular tourist sight. Another factor influencing the appearance of Paris is that the laws in relation to street-front alignment, building height and building distribution were under strict control from the early 17th Century. Paris owes its style to distinctive cream-grey “Paris stone” building ornamentation, aligned top-floor balconies and tree-lined boulevards. Place Pigalle - an entertainment centre. The Latin Quarter - a concentration of France's intellectual life on the Left Bank. Unlike many other cities in Europe its fabric has not suffered from catastrophes and wars. In 1954 the population of Paris was 2,850.000. It was easy to move around the city comfortably. Tourists were few and there was no feeling of population pressure. There was little evidence in the streets of Paris of the influx of people from Overseas France, who were French citizens at birth. This changed over time and was evident on subsequent visits to Paris. Eiffel Tower - designed by Gustave Eiffel (1832-1923). The façade of the Cathedral of Notre-Dame de Paris (built 1163-1245). East end of Notre-Dame de Paris seen across the Seine. The bouquinistes - second hand book sellers on the bank of the Seine. 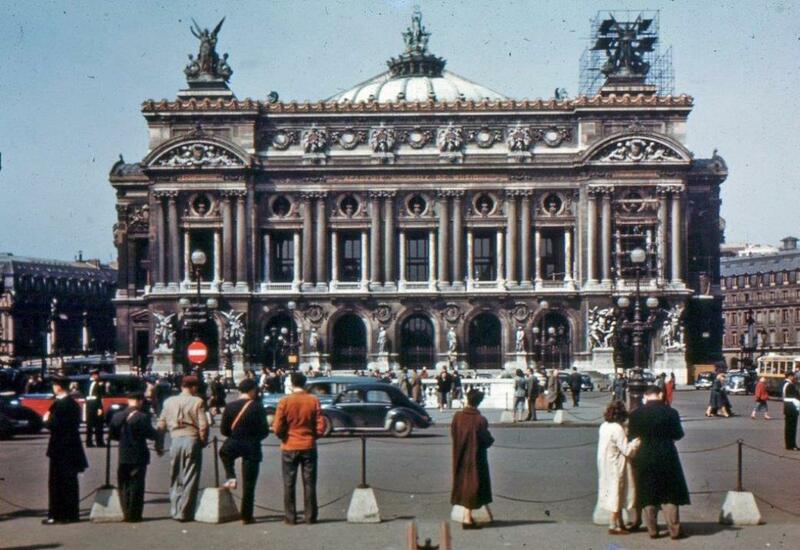 The pictures accompanying this article are the “must see sights” in Paris in 1954. They are, of course, still there – but now there are others. Most of the post- World War II presidents have wanted to leave their own monuments in Paris. President Georges Pompidou started the Centre Georges Pompidou (1977) – cultural centre and modern art - Valéry Giscard d’Estaing began the Museé d’Orsay (1986) – Western Art from 1848 to 1914 – François Mitterand – Opéra Bastille (1985-1989); Bibliothèque Nationale de France (1996); Arche de la Défense (1985-1989); Louvre Pyramid (1983-1989); Jacques Chirac (2006) Musée du quai Branly – Jacques Chirac – Indigenous Art and Culture of Africa, Asia, Oceania and the Americas. Today there is more to see in Paris than ever before. Dome of the Church of the Invalides. The massive tomb of Emperor Napoleon I in the Church of the Invalides.